Wind, waves and cloud tend to go together. Wind blowing over open water quickly creates waves. Wind strength can be measured in knots, mph, km/h or on the Beaufort Scale. See Winds & The Kayaker. A local onshore Force 4 wind can generate good surf if it lasts a day or two. At beaches on the lee side of an ocean, the best waves are created by storm winds in mid-ocean and travel long distances as swell before reaching the coast. If there's a good swell running, a slight offshore wind at the beach can be good, making the waves a little steeper. Wherever the waves were generated, if there is a Force 5 at the beach then the surf is likely to be mushy. In a Force 6, surf is probably "blown out", flattened by the wind. An average kayaker with a suitable kayak and a reliable roll can have fun playing on surf which is anything from 2 to 6 feet high. Surf always looks a lot bigger from a kayak than it does from the parking lot, and 6 feet feels really big. You can spend years of winter weekends on Atlantic surf beaches and never see a wave more than 8 feet high except during a gale. Pacific surf beaches get the occasional winter day of colossal waves, 13 feet and more. For good surf, you want a beach with a shallow gradient. If you want big surf go to beaches which face west over the ocean so the length of fetch is hundreds of miles and mid-ocean winds have many days to build up a good swell. If you want big but friendly, look for beaches which are on the lee side of an ocean and exposed to it, but do not directly face the approaching waves. On any beach, the waves will change as the tide rises, turns and falls. Surf is usually better when the tide is coming in. In surfer speak, when the tide's on the push. For technical information about what's happening this very moment on surf beaches round the world, go to Magic Seaweed. While you're walking down the beach, have a look at the waves and find the easiest place to launch. To go afloat, do a seal launch. Place your kayak at the water's edge, pointing out to sea, get in, fit your sprayskirt and use your arms to slide it into the water. Keep your kayak pointing straight into the waves. If you are not at 90 degrees to the waves, they will grab the front of your kayak, turn you sideways and shove you back up the beach. It is easy to paddle over a green wave. The water moves up and down, but it does not go towards the beach. You just go up and over the top. However all the waves near the beach are breaking. A breaking wave consists of a large amount of water rushing towards the beach. When a big one hits you in the chest and face, it will stop you and push you some distance backwards. It may reverse loop a short kayak. Punching out through even quite small waves takes some strength and determination. Try this. Just as a wave hits you, lean forward as far as you can, with your forehead close to the foredeck. Reach forwards and plunge your paddle almost vertically down deep into the wave. And hold on, so that the paddle anchors you in position while the wave roars past. Then paddle as fast as you can, to get out into the open sea before the next breaking crest hits you. Beginners find it a lot easier if somebody gives them a push into deeper water. Most of this page is about surfing for fun but here we’re thinking defensively. You’re at sea, you’re cold and tired, and you don’t like the look of the surf hitting your chosen beach. How about this, for example? 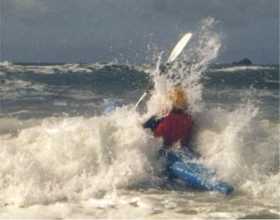 It is not generally a good idea to plan a sea kayak trip which finishes on a surf beach. By the time you get there, you may find big waves breaking all the way along. Even a keen kayak-surfer may have a rough ride. But there you are, in your kayak at sea, looking towards the beach, and in between is the back of a surf line that you don't want to get involved with. You can see muscular wave backs shouldering up, leaning forward and falling with long streaks of foam and rumbling clouds of spray. Stay well back from the surf line because occasional bigger waves will break 20 or 30 yards further to seaward. You have several options. First, look for a quiet part of the beach. Even if surf is breaking all the way along the beach, probably the waves are smaller at one end. 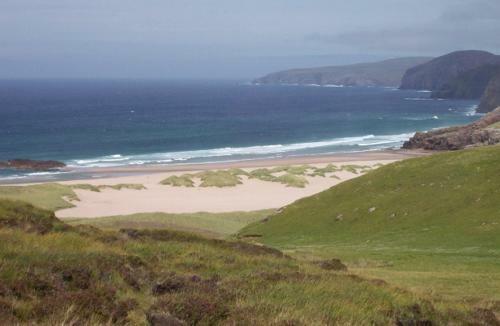 There may be a wave shadow in the lee of a headland where waves lose power, slow down and hit the beach more gently. Click here for a discussion of wave shadows. If a river enters the sea at that beach, there may be a wave-free zone in the river channel but this is not guaranteed. At beaches where there is no river, there is very often a wave-free zone at a rip current. A breaking wave consists of a lot of water rushing up the beach, and that water has to get back out to sea somehow. On many beaches it moves sideways along the beach at walking pace until it can go no further, and then it flows back out to sea in a narrow, intense current like a river. Waves there are usually smaller and often don't break at all. If there is no quiet place on the beach, look for a quiet time. If you watch for ten minutes you will start to notice a pattern. Usually, a set of three or four big waves comes in every five minutes or so. The sea may be quite quiet between sets. It may be easier to go to a different location to get out of your kayaks. There is probably another beach just round the headland which faces the waves less directly and so has much less surf. There may be a harbor nearby. If you really, really don't like the look of the surf and you have no other choice, you could try waiting a few hours. Big surf seldom lasts more than a few hours. The most common thing for one surfer to say to another is "you should have been here earlier". Either the swell dies away or the rising or falling tide changes the profile of the beach so that waves break more gently. To steer during a surf run, you can exaggerate a stern rudder so that the rear blade is far out to the side of the kayak and has a powerful turning effect. You can also angle the blade so that it skims over the surface like a water ski and gives you solid support while you lean on it and press down. See Stern Brace. Everybody capsizes a lot in surf. You can use any roll to come up, but be aware that you may need to wait upside down for five seconds until the wave releases you. There are times in big surf when you capsize and your speed pins you backwards along your rear deck. You can't sit up to start an ordinary roll so only a layback roll will do. Always roll with the wave, so that you come up on the sea side of your kayak, not the beach side. If you try to roll against the rotational forces within the wave, you will probably fail. Rolling with the wave is easy. See the illustration at Steyr Roll. In fact, if you are in a low brace or high brace position and you capsize downwave, there is a fair chance that the wave will roll you up again before you have time to think. When the wave breaks, your kayak may be caught sideways and carried towards the beach. Do a low brace - just reach out and put your paddle blade flat on top of the wave. Unless the wave is very small you need to lean into it. The wave will do the work, giving a surprising amount of support to your paddle blade. You can often lean the whole weight of your upper body onto it. You must certainly edge your kayak towards the wave. Use your knee to raise the downwave edge. The kayaker in this image did not lean into the wave and did not raise his knee enough, so when the wave shoved him sideways the bottom of his kayak caught the water. He's going to capsize. It's a bit like tripping over a rock while trying to take a step sideways. If you're sideways on to a big breaking wave a low brace won't cut it so you need a high brace. See below. If you are surfing down the face of a steep wave and the front end of your boat starts to dig into the water, lean your body backwards if you don't want to do a "pearl dive" and forward loop. Or forwards if you do. Again, see below. Sea kayaks surf beautifully on fast waves with a shallow gradient. Out at sea, if you are travelling in the same direction as the waves and your kayak is not heavily loaded, you can catch one wave after another and reach your destination much faster. In beach surf it may be a different story. If you are surfing a playboat or a surf kayak you can retain control, choose your direction of travel, make rapid course changes like a skier, loop round an obstacle, or travel diagonally along the wave until you reach a low point where you can paddle back out to sea. In a 17-foot traditional sea kayak you can't do any of those things, you can just go straight and fast to the beach. A sea kayak is very fast so you may outrun the wave. Then when it breaks you are a few yards ahead of the washing-machine turbulence of the break, you stay dry and upright, and you get a jet fighter boost to your speed. If you're in a traditional sea kayak, running on a steep wave when you start to head to the left, you probably won't be able to straighten up still less turn right. In a playboat or surf kayak you could easily change course. In a traditional sea kayak you can stern rudder, bow rudder and stern brace all you like but the deep, axe-shaped bow of your kayak has now taken over. Probably you will end up parallel to the wave, which will catch up and break on top of you. There are some modern sea kayak designs which have a flattened underwater shape instead of the traditional deep, axe-shaped bow. The idea is that you keep control when surfing steep waves. It really does work very nicely in surf, being both fast and maneuverable. However it may give you a noisy, splashy, wet ride on flat water unless the sea is dead calm. In the image, both the kayakers are doing a stern brace on the side nearest the wave. Which seems strange since that tends to turn them towards the wave when probably they would both prefer to turn the other way for a straight run to the beach. The thing is, they are halfway up a steepening ramp of water, and they are stern bracing at least partly to keep stable and upright. Try it and see. It can be a bad idea to catch the same wave as another sea kayaker. If you and your friend are twenty to thirty yards apart on the same wave when each of you starts a sweeping high-speed turn towards the other, you will soon be closing with a combined speed of 40 mph and it is quite likely one of you will end up as a kebab. Back in the days of taking fiberglass slalom kayaks into big surf your editor had a head on collision with a friend's boat at Saunton. Luckily this was also back in the days of surf kayakers wearing Mae West type lifejackets with a thick pad of foam on the chest, but he can still remember spending the next week sleeping in an armchair because lying down made his ribs hurt too much! On a breaking wave, any boat has a strong tendency to spin sideways until it is parallel to the wave (broach) and a kayak will then bounce towards the beach sideways, in the grip of the wave. This is called a sidesurf, broach surf or bongo slide. In a playboat or surf kayak you can quickly regain control. In a sea kayak you may be unable to regain control until the wave lets you go near the beach. A low brace is enough to keep you upright when a small wave hits you from the side, but in surf you will need to do a continuous high brace as in this image. It's much easier than it sounds, because the wave will support your paddle blade and you can rest your entire body weight on it. Lean into the wave, plant your paddle blade horizontally into the wave with the power face downwards, use your knee to raise the edge of the kayak which is away from the wave, and hang on because for the next 15 seconds things are going to be rough. However big the wave, don't let your hands go much above shoulder level or you risk getting a dislocated shoulder. You must raise the downwave edge of your kayak as far as you can. If you don't raise it enough, the bottom of your kayak will catch the water and you will capsize down-wave. When a traditional sea kayak is running on a steep wave, the axe-shaped front of the boat often starts to bury itself under the surface. Sometimes you can prevent this by leaning hard backwards in your seat. If not, you will slow down sharply and the back of the kayak will start to rise out of the water. 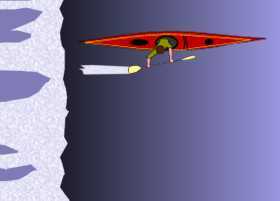 On a medium to large wave the kayak will often go vertical in a pearl dive and then topple over in a forward loop or pitchpole. You roll up, blink the water out of your eyes, look for the next wave and carry on playing. If your kayak goes vertical on a wave you can sometimes do a quick paddle stroke to twist your kayak 180 degrees on its long axis and land the right way up but now going backwards. That's a pirouette or dry loop. It's easier to do in a classic sea kayak than anything else, because shorter boats loop so fast that you don't have much time to react. If a long kayak stays vertical for several seconds, long enough for the crest of the wave to catch up, the front end of the kayak will find itself deep underwater. Water pressure will squeeze the end of the kayak and make it rise vertically in an ender. For about three seconds you get an unrivalled aerial view of the surf. A kayak can rise so fast that it leaves the water completely in a skyrocket. It may have occurred to you that a sea kayak is about 17 feet long, so if it's vertical in the water the front may be 6 feet under the surface. Is there usually that much depth of water in surf? Well no, there often isn't. The bottom end of a vertical sea kayak may land gently on the sandy sea bed in such a way that you gently polevault over it as in this photo. The risk in big steep surf is that it may slam into the sea bed with spine-jarring force and, if you have a composite or plywood sea kayak, snap it in half just in front of the footrest. If you feel like a surf session you can take a polyethylene kayak; or a surf kayak; or play someplace where waves form up, give you a fast run and then fade away again into a deep water channel; or visit a deep water playwave. The length and low rocker of a sea kayak prevent it conforming to the concave face of a steep wave but most kayaks, of any length, will pearl dive in surf. Your editor spent his college years surfing 13 foot 1 in fiberglass slalom kayaks in north Cornwall, looping on every other run and breaking two or three boats a season. When the club re-equipped with Dancers which were 11 ft 5 in and had more rocker, they were slower on flat water but it was suddenly possible to choose whether to loop just by leaning forwards or backwards at the critical moment. Then along came the short, flat bottomed Moccasin surf shoe and suddenly you had the speed to out-run a wave. See Kayaks For Surfing. • Try to steer to one side or the other. Works well unless it makes you broach because then you'll still be heading unstoppably towards the beach but now clearing a swath 17 feet wide. Then again, you're not going to cause any real damage if you run somebody over while going sideways. • Try an emergency stop by paddling backwards, digging your blade deep and hard into the wave. Works well on very small waves. • Hold your breath and capsize. Works well on small to medium waves, otherwise you just keep going but upside down. Whitewater kayakers are used to surfing standing waves on the river and most of them occasionally take their playboats and go surfing at the beach. They catch a green wave and go straight towards the beach, using their paddle in a stern brace for support and to steer at a slight angle to right or left. When the wave breaks, they often do a forward loop, land upside down, roll and go back out to do it again. Playboats loop much faster than sea kayaks but you may have time to turn a loop into a pirouette. These are old-school moves. They're fun but only a fraction of what a surf kayaker can do in a surf kayak or waveski. At the very least, (s)he can steer right and left, stay in control whether the wave is still green or has started breaking, and not loop the kayak unless (s)he wants to. Surfing today means being able to carve turns so that having accelerated down to the bottom of the wave, you can turn and go back up to the top. With practice and a suitable kayak you can catch a wave, go down to the bottom of its steep front face, then turn and cut back up the face of the wave, turn again and come back down, and keep on doing that all the way to the beach. Or go airborne for a moment at the crest. Or do a 360 degree flat spin. • Guide to Surf Kayaking. Nigel Foster, Globe Pequot, 1998. • Surf Kayaking: The Essential Guide. Simon Hammond (former world champion), Green Room Publishing, 2005. 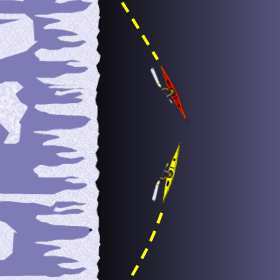 • Website of the British Waveski Association. Kayak surfers spend a fair amount of time upside down in cold water. They never get colds, but some of those who do it regularly for years get "surfer's ear" in which bony growths constrict the ear canal and cause repeated ear infections. To avoid this, you can wear a skull-cap or hood made of thin thermal stretch material so it fits under your helmet. If somebody goes for an accidental swim, another kayaker can sometimes tow or push the casualty out to sea for a deep-water rescue or do a lightning-fast rescue within the surf zone. See Towing A Kayak and Deep-Water Rescue & Self-Rescue. It is usually best if the casualty swims to the beach. If that's you, keep hold of your paddle and one end of your kayak. If your kayak has bulkheads and/ or a full set of inflated buoyancy bags you will find it easy to swim it to the beach. Each breaking wave will push you in that direction. If you don't seem to be making much progress you are probably in a rip current heading directly out to sea. Swim parallel to the beach until you are out of the rip, then swim to the beach. Stay on the seaward side of your flooded kayak, especially when the water is only knee deep. A flooded kayak weighs well over 200 lbs. Elsewhere we discuss the technique for helping a non-kayaker who is in trouble at a surf beach. See Kayaker-To-Swimmer Rescue. Waves don't break across their whole width at the same time. Part of the wave peaks up and breaks, and the break moves sideways. The place where the breaking crest meets the unbroken wave is called the shoulder. Board surfers and wave-ski paddlers aim to catch the wave at the shoulder, and stay on the unbroken wave as the shoulder travels along it. Although maybe not on this particular wave, because the unbroken part is heading for the rocks. i. If more than one surfer attempts to catch a wave at the same time, the one closest to the point where the wave first breaks will have right of way if he catches it. ii. Once a surfer has caught a wave, another surfer may not paddle inside and take-off closer to the shoulder. iii. The point when a surfer can be considered to have caught a wave is when (s)he stops paddling, kicking, or stroking and continues to move down or along the wave under force of gravity. If a surfer can ride from a completely broken section to a unbroken section that is not already being ridden, they will then be entitled to right of way. C. A surfer riding a completely broken wave section and has ceased to make any progress towards the shoulder has no rights over any unbroken part of the wave. A surfer can gain right of way if able to ride out of the white water onto a unoccupied, unbroken wave section. D. A surfer who takes off at the shoulder on one side of a short section of breaking crest has no right of way over a surfer who is already riding the other shoulder. This means a surfer cannot cross under the peak to the opposite shoulder if it is already occupied. E. A wave rider must avoid all swimmers or surfers who are either stationary or paddling out. a) Board surfers like to go diagonally across the face of the wave, not straight up the beach. That way, they can go twice as fast over the water and stay on the wave twice as long. A surf kayak or waveski can do the same but most kayakers surf only occasionally, in playboats. They just catch a wave and go straight up the beach. So, the presence of kayakers can stop board surfers doing what they came to do. b) Any kayaker can paddle faster than a surfboard so (s)he can catch a wave further out to sea. If a group of kayakers catches every single wave for an hour, it's got to be annoying for the board surfers. c) Some kayakers don't understand surf etiquette. d) If you are in the water, the possibility of a collision with a kayak is a lot more worrying than a collision with a surf board. The best waves for board surfers are the best waves for kayakers, but we can also get a lot of fun from surf which is no good for board riders. It is often worth going to the other end of the beach where the break is smaller or messier, or where there's a strong longshore current or a strong flow from a river mouth, or where waves are breaking on a reef and so are more attractive to a kayaker (in helmet and body armor) than to a board surfer. We can also surf at one of the many beaches which have no parking lot but which are a ten-minute paddle from a beach or harbor. There are thousands of lovely little coves with perfect surf beaches. They're underwater at high tide but the only conflict is when a peregrine falcon takes out a pigeon.